The blue bands of Pluto's atmospheric haze, captured in high resolution by New Horizons' Long Range Reconnaissance Imager (LORRI), with additional data from the Ralph/Multispectral Visible Imaging Camera (MVIC). A tiny, cold rock, Pluto seems almost incapable of having an atmosphere. Between its small size and its distant location, the dwarf planet seems unlikely to have what it takes. Yet when NASA's New Horizons craft arrived at Pluto in July 2015, it found a surprisingly robust atmosphere on the tiny planet. Nitrogen dominates the gases in Pluto's atmosphere, with carbon monoxide and methane present in smaller amounts. The thin atmosphere lies over Pluto in a bluish haze, which was especially apparent in images taken after the encounter, when the dwarf planet was backlit by the sun. The haze extends at least 100 miles (160 kilometers) above the surface of Pluto, five times higher than models predicted. Layers of the atmosphere are apparent in various images captured by New Horizons. "In addition to being visually stunning, these low-lying hazes hint at the weather changing from day to day on Pluto, just like it does here on Earth," Will Grundy, leader of New Horizons' composition team from Lowell Observatory in Flagstaff, Arizona, said in a statement. Complex organic molecules in Pluto's atmosphere provide a blue tint to the haze. Although the material, known as tholins, have a reddish tint, they scatter light at blue wavelengths. A similar process provides Earth with blue skies. Eventually, the tholins fall to Pluto's surface, giving the planet its reddish-orange tint. "Who would have expected a blue sky in the Kuiper Belt?" New Horizons principal investigator Alan Stern of the Southwest Research Institute (SwRI) in Boulder, Colorado, said in a statement. "It's glorious." Pluto travels around the sun in a distorted orbit, ranging from 30 to 50 times as far from the star as Earth. The changing distance to Pluto is thought to affect the planet's atmosphere. When Pluto lies closer to the sun, the ices thaw and when it is farther away, the gases re-freeze and solidify. Pluto's largest moon, Charon, is almost as massive as the dwarf planet itself, leaving many to dub it a binary system. New Horizons revealed that, as the atmosphere of Pluto escapes into space, some of it is captured by the gravity of the large moon, where it is siphoned to the northern pole. The falling material creates the reddish spot seen by the probe. 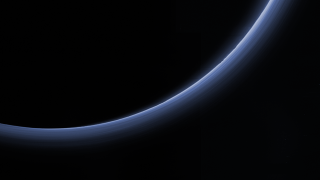 A graphic from NASA shows Pluto's hazy atmosphere, as seen by the New Horizons spacecraft. The inset provides more detail about the haze layers. Pluto is so far away that studying anything about it is a challenge. To confirm that the dwarf planet did indeed have an atmosphere, astronomers studied it as it passed in front of bright stars over the course of its orbit. They noticed that the stars dimmed before Pluto itself moved across it, as the atmosphere of Pluto slowly blocked their light. The experiment was repeated with several stars, allowing astronomers to understand more about the air on Pluto. Later observations by New Horizons revealed more detail about the tiny world. In addition to observing the planet in sunlight, the spacecraft also observed the world as it retreated, when it was illuminated only by the light of its largest moon, Charon. Pluto lies in the Kuiper Belt, one of millions of objects left over from the formation of the solar system. Its atmosphere resembles Neptune's moon Triton, which boasts clouds and winds. Triton is suspected of being a captured Kuiper Belt object. But Pluto's atmosphere is thicker than Triton's, although Neptune's moon is more massive. Scientists once thought that Pluto could have clouds, but New Horizons showed only a layered haze. Prior to the mission's arrival, scientists expected that much of the nitrogen atmosphere would have escaped into space. However, the planet maintained a surprisingly dense haze, suggesting that something is feeding it. "More nitrogen has to come from somewhere to resupply both the nitrogen ice that is moving around Pluto's surface in seasonal cycles and the nitrogen that is escaping off the top of the atmosphere as the result of heating by ultraviolet light from the sun," Kelsi Singer, a postdoctoral researcher at the Southwest Research Institute, said in a statement. An expert on impact craters, Singer is working with Stern to identify the source of the nitrogen in the planet's atmosphere. The atmosphere may be coming from the interior of Pluto, through methods such as ongoing geysers or ice volcanoes, according to Stern. This is supported by young-looking regions on the surface of the planet. No geysers have yet been identified from New Horizons' data, but several of the mountains on Pluto have been suggested to be ice volcanoes.